100% responsive: Built with HTML5 and CSS3 based on the Bootstrap 3.0 advanced Grid system, Payment page adapts automatically to your tablets and mobile devices. 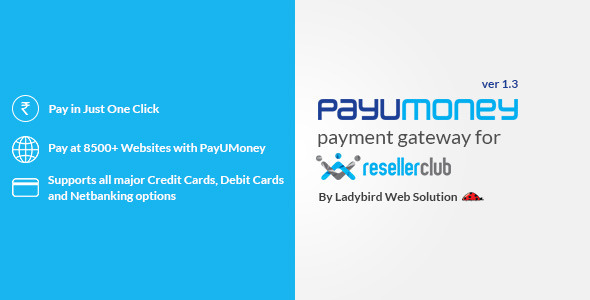 This extends Reseller Club to accepts money/payments through Payu Money Payment gateway on your supersite. PayU Money serves more than 4000 merchants including leading e-commerce companies, integrate it with your supersite or reseller panel provided by Reseller Club. Open the documentation, make slight changes, enter API/key values from Payu Money & Reseller Club account to the files as shown in documentation. Start accepting payment on your store front within 5 to 10 minutes.